Creating a safe, comfy and calming sleeping place for your child to sleep will be the difference between them peacefully going down at bedtime or having a meltdown. You may be a parent or grandparent who knows what impact it has on a family if a child does not want to sleep in their room, or if they just don’t sleep well. Children are ultra sensitive to energy. If their bedroom is not set up to be restful and conducive to getting a good night’s sleep, every family member is impacted. Once you understand what guidelines to give, let them choose between three or four appropriate choices. They can still express themselves but it won’t impact their ability to sleep well, which has a huge impact on not only their health but the well being of the entire family. Choose restful colors for the walls, sheets, and PJs: Colors are hugely powerful and impact us profoundly, especially children. Choose wall and ceiling art that is empowering and happy, yet balanced and restful. Anything that leaps, dives, jumps fights or zooms around the room is not going to inspire a good night’s sleep. Guide the child in the direction of choosing art and objects that support healthy development. Messages of aggression or violence, no matter how cutely they may be represented are not only sending negative messages but are too active for bedroom art. Make sure the first thing the child sees in the morning and the last thing they see at night is the most empowering and positive message in the room. Bed Placement: The bed should be placed in the empowered position, where your child sees the doorway from their pillow but is not in direct alignment with the strong energy that comes through open doorways. Remove or cover all large mirrors, especially on the closet door. Treat mirrored closet doors like a window and add curtains and close them up at night, cover with sticky back shelf paper, paint them or remove them altogether. Hide toys from the view from the bed. Organize the toys and keep them in bins or behind doors and drawers which are placed below the view-line from the pillow. You can’t expect the child to not want to be playing all night when the toys are beckoning… come to play with me. 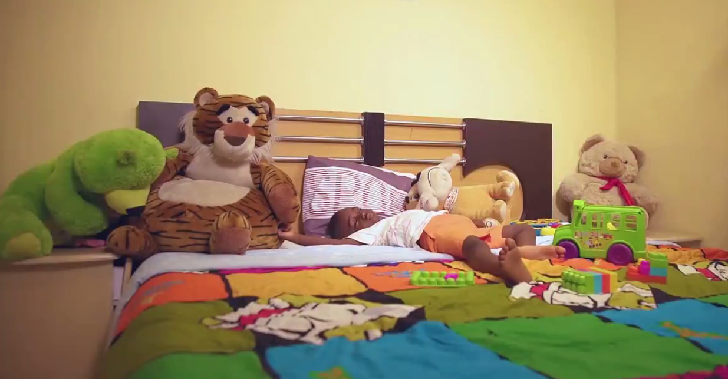 Cover stuffed animals with a blanket or a throw and put them to bed, closing down the playful energy until morning. Organize and clutter clear. When the bedroom is in chaos, children will feel overwhelmed and insecure. Edit the toys and make sure they are current and donate the ones they are no longer using. Make sure there is adequate storage for toys, organize the closet so that it stores only current clothing and donate what is no longer worn. Disorganization is often because space does not have adequate, functional shelving or closet space. Investing in a few pieces that will hold everything will make a huge difference and facilitate easier up-keep.